TRANQUIL Nuuanu Reservoir could store as much as 1.1 billion gallons of water behind its 66-foot-high dam, but it does not. The Honolulu Board of Water Supply normally keeps just 80 million gallons in it, to leave plenty of room for storm runoff storage and to reduce pressure on its 96-year-old earthen dam, said Glenn Oyama, a staff hydrologist-geologist. Downstream from the dam, hundreds of homes in Nuuanu Valley from Nuuanu Pali Drive down to Wyllie Street would be in a flood's path if the dam ever failed. But it has not -- and the evacuation map for a "worst case scenario" remains an unused page in the Honolulu Emergency Operations Plan. 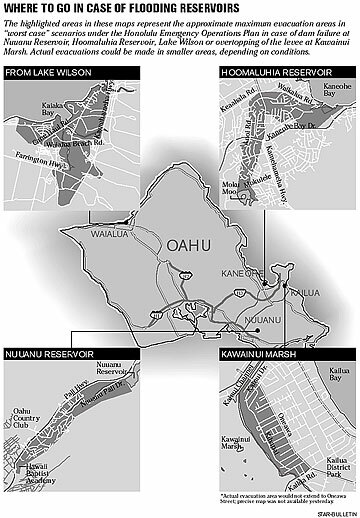 Nor have the "worst case" maps for Oahu's two other major dams ever had to be used: Dole Food Co.'s Wahiawa Dam on Lake Wilson and the city's Kaneohe Dam at Hoomaluhia Botanical Gardens. If those dams failed, hundreds of buildings in Waialua, Haleiwa and Kaneohe would be in harm's way. "We're keeping the reservoir levels low in the interest of safety," based on recommendations from engineering studies done in the late 1990s, Oyama said on a tour of Nuuanu Reservoir and dam Friday. By comparison, the low-lying Otake Camp downstream of Lake Wilson has had to be evacuated five or six times in the past eight years when Lake Wilson's level rose four feet over its 80-foot spillway, said Oahu Civil Defense spokesman John Cummings III. According to the city's emergency plan, if the level rises to 85 feet, much of Waialua and Haleiwa would be asked to evacuate. It's the potential loss of life and property that gives Oahu's three largest dams the "high hazard potential" rating by the Interagency Committee on Dam Safety, not the safety of the dams themselves, said Board of Water Supply spokeswoman Su Shin. The state Department of Land and Natural Resources was asked when it last inspected Oahu's dams, but did not respond in time for this article. 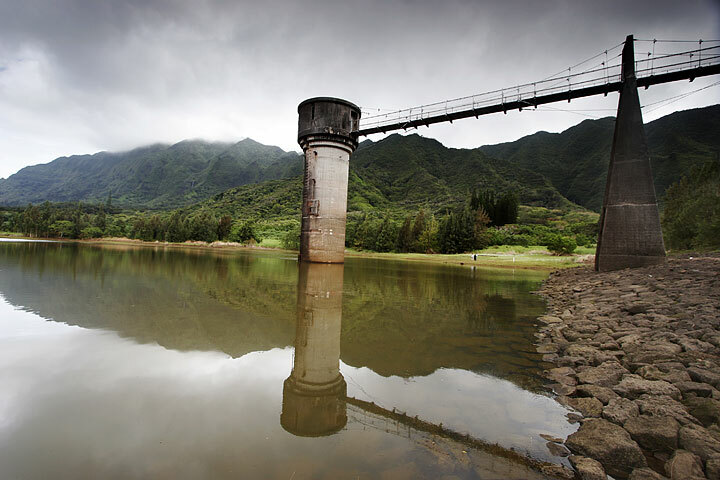 The department is responsible for inspecting most of Hawaii's dams. Since the breach Tuesday of Ka Loko Dam on Kauai, the department's lone dam engineer and three other civil engineers have been inspecting all of the 23 high-hazard dams on that island. Ka Loko had not been reclassified as high hazard after homes were built downstream from it. The DLNR has no record of ever inspecting it. The resulting flood in Wailapa Stream caused by the dam break swept two homes away and killed three people, while four others remain missing. And it set Hawaii residents to thinking about dams. "It's kind of scary with the weather lately," said Deidre Kaeo, who works at the UPS Store in Kaneohe Shopping Center. The businesses in the center are within the evacuation zone if there is ever a major failure of Kaneohe Dam upstream. "You can never be safe from a dam failure," Cummings said. "Anything engineered by man may have its frailties." 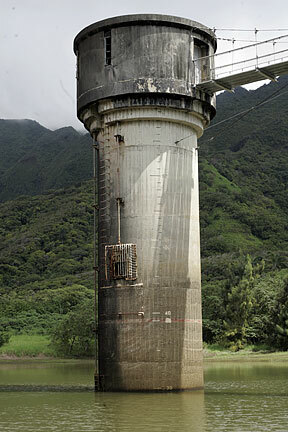 At the Nuuanu Reservoir, the tall cylinder in the water is the "outlet works" that contains the drainage pipe for excess water. However, Cummings stressed that Oahu's dams are well-monitored and maintained by their owners: "And there is a very good system in place to warn the Civil Defense system if there's a problem. That's really the key." "Where the dams (that failed) are on Kauai, they are out of sight, out of mind," Cummings said. "My aunt who was born and raised in Koloa (on Kauai) didn't know about Ka Loko." Nuuanu Dam, with a capacity of 3,600 acre-feet, was built to provide drinking water for Honolulu, though it has not been used for that purpose since 1919, said Shin. Instead, the DLNR maintains a population of catfish in the lake for recreational fishing. Nuuanu Dam is "hydro-engineered' earth, which makes the reservoir stronger because the soil is highly compacted, said Oyama. It also has sheet metal reinforcements inside its base, rock on its inner slope to deter erosion and moisture-reading gauges that could warn of problems, he said. Its spillway has only been used six times in the dam's history. Lake Wilson, which can hold up to 9,200 acre-feet of water, was created primarily to provide irrigation water for agriculture. It has a concrete dam. Kaneohe Dam, on Kamooalii Stream at the base of the Koolau Mountains, has a 4,500 acre-feet capacity. It is an engineered earthen dam, built for flood control, in response to devastating floods in Kaneohe in the late 1960s, Cummings said. Since it was built, the Army Corps of Engineers-designed Kaneohe Dam has never used its spillway, city spokesman Bill Brennan said. Though not a dam, the levee at Kawainui Marsh in Kailua also is a point of flooding concern. Water from the marsh on New Year's Eve and Day 1987-88 caused flooding in the adjacent Coconut Grove subdivision. The levee was improved by the Army Corps of Engineers as a result and since then has not topped its new 15-foot height, Cummings said. Oahu has three large, dammed reservoirs and one natural marsh with a levee that could cause significant flooding if they are breached. In each case, the dam or levee owner is required to notify Oahu Civil Defense when water levels reach a certain point, so the agency can assess the need for possible evacuation. Wahiawa Dam, a concrete dam, was built in 1906 on Kaukonahua Stream, creating Lake Wilson. Its purpose is to provide irrigation water for agriculture. Safety triggers: When the water level reaches 80 feet, water goes over the dam spillway and Civil Defense is alerted. At 84 feet, downstream flooding is expected and evacuations begun. Highest level since U.S. Geological Survey gauge installed in September: 85 feet on Oct. 1. This natural wetland flooded the nearby Coconut Grove neighborhood on New Year's Eve and Day 1987-88. The event prompted an enlargement of the existing earthen flood-control levee and addition of a cement wall by the Army Corps of Engineers. Safety triggers: Oahu Civil Defense is notified when the water level is at 7.5 feet; the improved levee would overtop at 15 feet, which has not happened since it was built. Highest level since U.S. Geological Survey gauge installed in February 2001: 7.25 feet on March 3. Nuuanu Dam, an engineered earthen dam, was built in 1910 on Nuuanu Stream and reconstructed in the 1930s. Originally used for drinking water, it is now used for recreational fishing and flood control. Safety triggers: Any developing unsafe condition, or a water level of 55 feet. The reservoir is normally kept at 30 feet. Highest water level: In the past 10 years, the water has never exceeded 43 feet. Kaneohe Dam, an engineered earth dam, was built by the Army Corps of Engineers as a flood control project on Kamooalii Stream in 1980. Safety triggers: When rainfall equals 7 inches in 6 hours or 11 inches in 24 hours at the Luluku rain gauge, or the reservoir pool level reaches 177.5 feet above sea level. It is normally at 160 feet above sea level. Highest water level: Not available yesterday, but since the dam was built in 1980, it has never used its spillway. Kawainui Marsh and Wahiawa Dam water levels are posted on the U.S. Geological Survey Pacific Island Water Science Center Web site at: http://hi.water.usgs.gov. Sources: U.S. Geological Survey, Honolulu Board of Water Supply, Oahu Civil Defense, City of Honolulu Emergency Operations Plan, city spokesman Bill Brennan, state Department of Land and Natural Resources.